Mexican Folk in the Heart of Chicago Chicago is one of the world's great music cities, but it's still surprising that a Latin Grammy-nominated Mexican folk group calls it home. Sones de Mexico is a group of musicians, all immigrants now living in Chicago, who play an enormous variety of Mexican folk styles. Chicago is one of the world's great music cities, but it's still surprising that a Latin Grammy-nominated Mexican folk group calls it home. Sones de Mexico is a group of musicians, all immigrants now living in Chicago, who play a wide variety of Mexican folk styles. 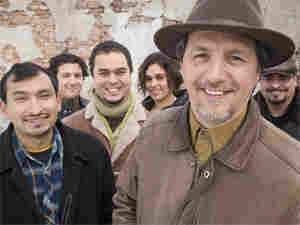 Their latest release, Esta Tierra Es Tuya, has been nominated for Best Folk Album. Son is the traditional Mexican music that gives the band its name. But the most striking songs on Sones de Mexico's new CD draw on more diverse influences, including hard-rock giant Led Zeppelin and its song "Four Sticks." "We were invited to a Led Zeppelin tribute and local bands would just do cover versions of Led Zeppelin," member Juan Dies says. "So they invited us. I think it was a joke in the beginning." "This piece attracted me, because it was very rhythmic," Dies says. "It's actually in 5/4 time, which is a very exciting time. We began to transform it into an Aztec ceremonial dance, and when you listen to Aztec drums, you have the same feeling of power and drive that you would get from heavy metal." Led Zeppelin isn't the only surprise on Esta Tierra Es Tuya. Sones de Mexico has also taken Johann Sebastian Bach's "Brandenburg Concerto No. 3 in G Major" and arranged it as a jarocho, a folk style from the Mexican state of Veracruz. The new interpretation uses traditional instruments, including the lower jawbone of a donkey, as percussion. "When it dries, all the teeth will rattle," Dies says. "You can hit the side of it or scrape across the teeth with a deer antler." Sones de Mexico's presentation is a sight to behold, but Dies is quick to point out that the band does not exist to present any one idea about the music of Mexico. "Our group specializes in the Mexican tradition of son," Dies says. "But we are not necessarily preservationists in trying to pretend that we live in a small village in Mexico. We live in Chicago and interact with the world around us."